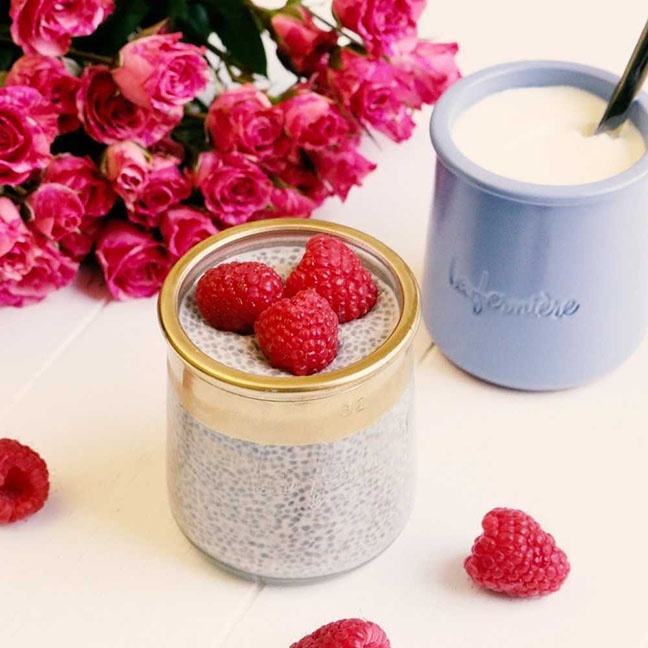 Served in our La Fermière glass pots, this creamy overnight chia seed pudding makes for the perfect breakfast before heading out the door in the morning. Not only does it taste amazing, but it contains a generous amount of protein, antioxidants and other healthy nutrients that will give you the energy to get your day started. With these few minimal ingredients and five minutes of preparation, you will be ready to enjoy this delicious pudding after letting it sit overnight. • Add fresh berries to serve! (1) Add all ingredients except chia seeds to a medium bowl and whisk vigorously to combine. Then, add chia seeds and to the mix. (2) Cover the bowl with plastic wrap and refrigerate overnight. You want pudding-like consistency in the morning. (3) In the morning, give the pudding a good whisk to evenly distribute chia seeds that have settled on the bottom. Pour into La Fermière pots and enjoy chilled with desired toppings.